If the combination of Star Wars and Pringles isn't weird enough (although they are two things that I love very, very much) look closer at the Pringles character (??) on each can. Chewbacca Cheddar Cheese - This one was the first I noticed and the Chewie bandolier of cheddar cheese is pretty awesome. 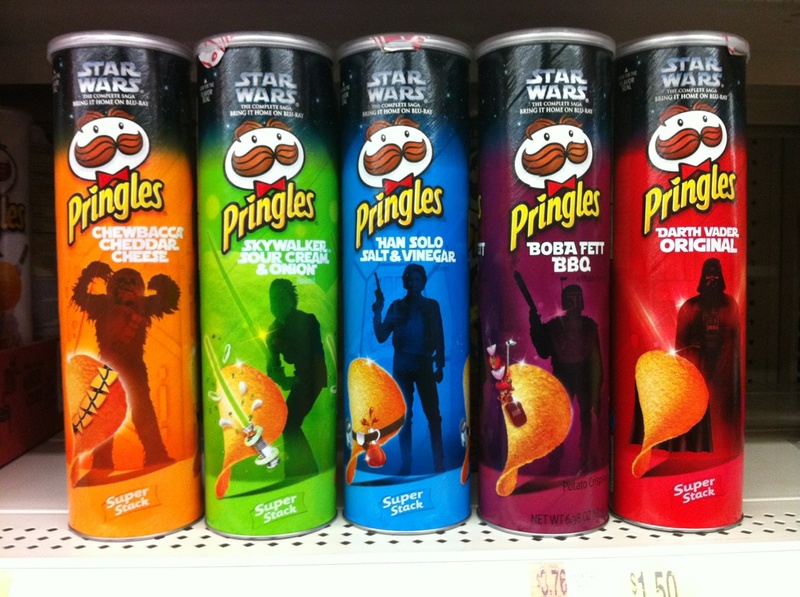 Skywalker Sour Cream & Onion - I'm guessing Luke's lightsaber is cutting up some sour cream? Or is it crying from the onion? Han Solo Salt & Vinegar - There's Han's belt, with a bottle of vinegar hanging off. As we go down the line these get weirder and weirder. Boba Fett BBQ - This one has a kebob of BBQ and Boba Fett's barely recognizable antenna thing. Note, this one is NOT a Super Stack. Darth Vader Original - It's as boring as it's name. I didn't even realize the Pringle was wearing his cape at first. I bought the Chewbacca can for my daughter because she loves both Chewie and cheesy chips and kept on shopping. Then I came across across another Star Wars food product! 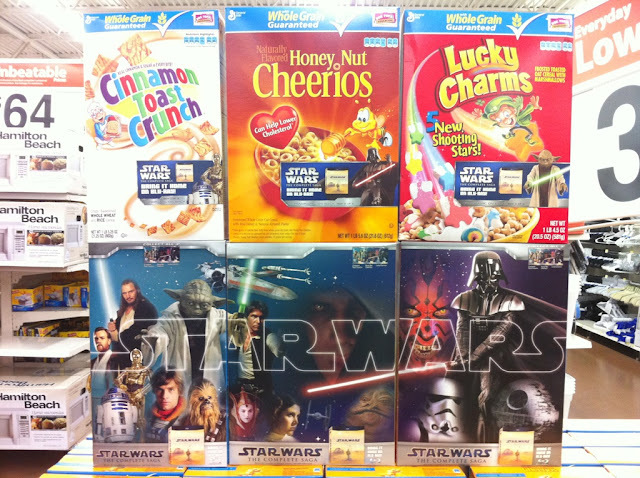 Cereal boxes with a 3 part poster on the back. It's weird for a billion reasons, but here are my top 2. 1. What do you do with these? Are you going to cut out the backs, assemble them and then hang them on your wall? 2. Why didn't they make all 3 boxes the same size? The little tiny one on the left looks funny. I thought more and more about this and realized that kids don't care about either of these issues. If we had the cereal in my house, my daughter would beg me to cut out the back so she could hang it up, or even just carry it around. So there is a purpose. It's for the children! 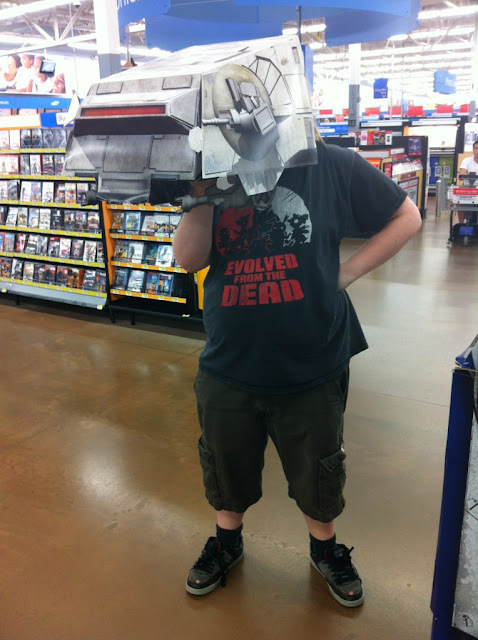 Speaking of children.. check out what we did with the broken AT-AT display. When I finally make it to America, I will be heading firstly for a Walmart. I've heard theyre a treasure of novelty and wretchedness. SECONDLY a White Castle, which kind of makes me wretched as well. ..and there are about 10 Walmarts within 10 minutes of my house.